In 1894, Los Angeles found itself in a period of depression. The leadership of the Los Angeles Merchants’ Association thought that a festival might draw visitors from across the country who had traveled to attend the San Francisco Exhibition, already in progress. 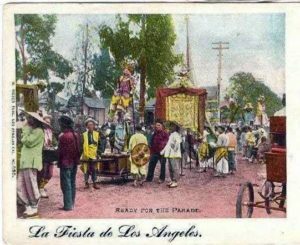 Max Meyberg, owner of the Crystal Palace Crockery & Glass Store, volunteered to be Director General of the three-day La Fiesta de Los Angeles. 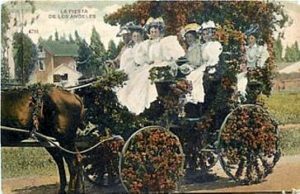 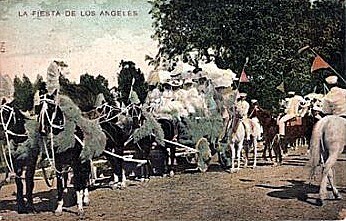 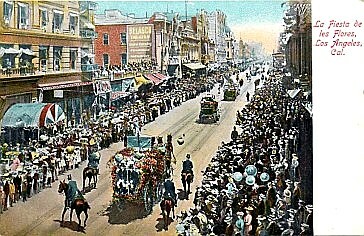 During the first day of festivities, a parade of decorated wagons and participants came to City Hall, where they disposed the Mayor and City Council of their duties and an elected the Queen of the Festival, who “ruled” Los Angeles – all in good fun. The successful inaugural Festival was held in the Spring of 1894, and was repeated in 1895 and 1896, drawing crowds of thousands each time. Fortunately, this was the period of early postcards, some of which have survived to this day.